Transparency Market Research has published a new report titled, “Global Truck Mounted Concrete Pump Market - Global Industry Analysis, Size, Share, Growth, Trends, and Forecast, 2018–2026.” According to the report, the global truck mounted concrete pump market is projected to reach US$ 8.5 Bn by 2026, expanding at a CAGR of 7.78% during the forecast period. 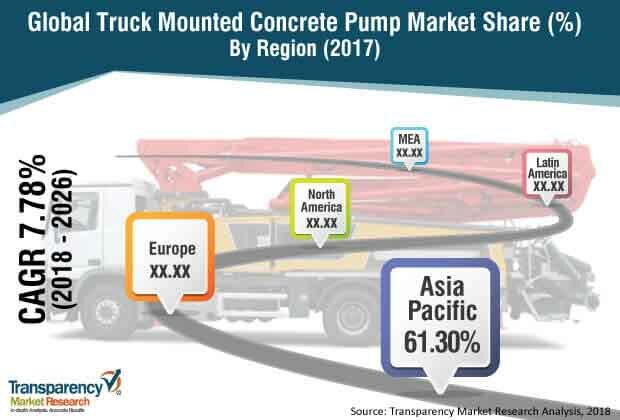 According to the report, the global truck mounted concrete pump market is likely to be driven by a range of macroeconomic and industry-specific factors. Asia Pacific is expected to be at the forefront of global demand, with the market in the region expanding at a CAGR of 8.57% between 2018 and 2026. Truck mounted concrete pump has been gaining popularity in construction industry due to its advantages such as precise transfer of liquid concrete, computer control robotic arm, requirement of less manpower, and high volume transferring capacity is minimum time with perfection. Adoption of advanced construction machinery in order to achieve quality in minimum time, shortage of skilled labor, and short time period are likely to use truck mounted concrete pump in construction industry. Furthermore, reliable operation with long service life at minimum operational cost, efficient operation through innovative pumps, and sturdy body are prompting operators to prefer truck mounted pumps for better quality in pouring concrete at higher accuracy. Expansion of the construction industry across the globe is anticipated to drive the truck mounted concrete pump market during the forecast period. Better business conditions for the construction industry across the globe, especially in developing countries, owing to decline in interest rates, residential home construction projects, long-term development projects such as dam construction, highway road constructions, development of business parks, rapid urbanization and growth in industrialization are likely to positively impact the construction industry. This in turn is anticipated to drive the truck mounted concrete pump market during the forecast period. In terms of type, the global truck mounted concrete pump market has been split into boom or truck mounted pump, trailer, line, or stationary pump, and specialized usage pump. Boom or truck mounted pump segment holds a major share of market. Boom or truck mounted concrete pump supplies liquid concrete in short duration of time with higher accuracy. Moreover, it also helps maintain the concrete strength. Furthermore, usage of the boom concrete pump is a highly efficient way of pouring large volume of concrete. Considering the advantages and operation efficiency, the boom or truck mounted pump segment is likely to expand at a significant rate, which in turn is anticipated to drive the truck mounted concrete pump market during the forecast period. Likewise, stationary concrete pump requires separate pipeline in order to carry concrete. Stationary pumps transfer the concrete at a lower speed, as compared to boom or truck mounted concrete pump; therefore, it is utilized in those applications that require smaller volume of pumping, such as swimming pool and small home concrete slabs. Specialized pumps are employed very rarely for specialized job sites such as mining and tunnel projects. In terms of end-use, the truck mounted concrete pump market has been classified into commercial, industrial, and domestic. The commercial segment includes multiple applications such as airport construction, highway construction, shopping mall, and tunnels. Significant investment in infrastructure in developing and developed countries is likely to boost the construction industry, which in turn is estimated to propel the commercial segment during the forecast period. Lower housing prices and government emphasis on housing, especially in developing countries, are likely to drive the domestic segment during the forecast period. In terms of region, the global truck mounted concrete pump market has been segregated into North America, Europe, Asia Pacific, Middle East & Africa, and Latin America. Asia Pacific is a prominent market for truck mounted concrete pump. Europe-China partnerships and initiatives, increased labor efficiency, rapid industrialization and urbanization, and stable economy are likely to drive the construction industry in China. Therefore, China holds a major share of the market in Asia Pacific. The partnership between China and Europe includes several projects such as strategies and polices relevant to the development of urbanization, urban housing supply systems and patterns, and urban green building, which in turn is anticipated to fuel the construction industry in China. Likewise, in India, projects such as smart city development, huge investment on road infrastructure and rise in urbanization are likely to propel the construction industry, which is anticipated to boost the truck mounted concrete pump market in India during the forecast period. Countries in North America also witnessed significant growth as stable GDP growth and decline in housing prices, which are anticipated to create good business environment in the region. Prominent players operating in the global truck mounted concrete pump market include CONCORD CONCRETE PUMPS INTERNATIONAL LTD, Junjin, Kyokuto Kaihatsu Kogyo Co.,Ltd., Liebherr, Liugong Machinery Co., Ltd., Putzmeister Concrete Machines Pvt. Ltd, SANY GROUP, SCHWING Stetter, Sermac Srl, Shantui Construction Machinery co.,Ltd., XCMG Group, and Zoomlion Heavy Industry Science&Technology Co., Ltd.